It is the misfortune of the Irish that they rose prematurely, before the European revolt of the proletariat had had time to mature. Capitalism is not so harmoniously built that the various sources of rebellion can immediately merge of their own accord, without reverses and defeats. On the other hand, the very fact that revolts do break out at different times, in different places, and are of different kinds, guarantees wide scope and depth to the general movement; but it is only in premature, individual, sporadic and therefore unsuccessful, revolutionary movements that the masses gain experience, acquire knowledge, gather strength, and get to know their real leaders, the socialist proletarians. The 23rd of November, 2018, marks the 105th anniversary of the formation of the Irish Citizens Army. The Connolly Youth Movement considers this formation as one of the most important in contemporary Irish history. 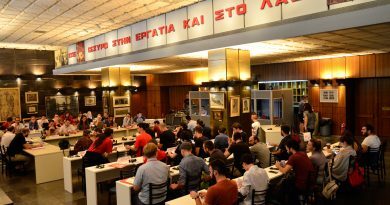 It was a force formed from the rank and file membership of the Trade Union movement to defend strikers that developed into the first working class army of Europe. The force was created against the backdrop of a hyper-aggressive cartel of employers led by William Martin Murphy who sought to completely smash any attempts at unionisation. Scabs as well as professional strike-breakers were imported throughout the lockout and in Wexford, a worker was killed during an altercation. The solution being taken was to form a sort of ‘workers’ militia’ that could, in times of strike action, defend workers from the brutality of the police. The process here is very much dialectical, the physical force of the employers and exploiters creates a demand for the union movement to broaden its functions and objectives and militant class consciousness emerges from this spiral of conflict. The very fact that the workers were unemployed due to the strike and its aftermath enabled them to train and ideologically develop. Yet the Irish Citizen Army wasn’t just an extension of the trade union movement, it was a completely new innovation in the organization of workers and trade union members. The ICA was not just formed to defend workers in times of dispute but also to advance the cause of Socialism in Ireland through militaristic means. The mission enshrined in its constitution was that “the ownership of Ireland, moral and material, is vested of right in the people of Ireland”. 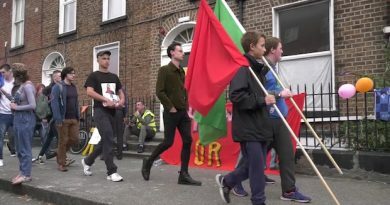 One would imagine that with the destruction of the Irish Citizen Army and the execution of its leaders, such a revolutionary demand could easily be suppressed by reactionary elements in the movement. The opposite happened, as the demands of the most radical section of the revolutionary forces evolved to become a demand of the whole revolution it was reiterated in the Programme of the First Dail, championed by Liam Mellows and Peadar O’Donnell. “We declare in the words of the Irish Republican Proclamation the right of the people of Ireland to the ownership of Ireland, and to the unfettered control of Irish destinies to be indefeasible, and in the language of our first President. Pádraíg Mac Phiarais, we declare that the Nation’s sovereignty extends not only to all men and women of the Nation, but to all its material possessions, the Nation’s soil and all its resources, all the wealth and all the wealth-producing processes within the Nation, and with him we reaffirm that all right to private property must be subordinated to the public right and welfare”. Nationalisation of all railways and canals. Abolition of private banks and money lending-institutions and establishments of state banks, under popularly elected boards of directors, issuing loans at cost. Graduated income tax on all incomes over £400 per annum in order to provide funds for pensions to the aged, infirm, widowed and orphans. Compare this programme to that of the demands advanced by the Irish Parliamentary Party, or the Home Rule forces or alternatively even the more militant Republican forces in the country. Compare this to modern Ireland. All of these principles besides item 10 have either never been introduced in Ireland or are under sustained attack by Fine Gael, Fianna Fail and Labour governments. Even something that may seem at first glance to have been implemented, like a 48 hour maximum working week, upon closer inspection is not in force. In Ireland today, we merely have a maximum average, so someone can work 70 hours in the week provided there is no work for them the week after. Reformists like those of the Labour party helpfully expose for us the myth of gradual progress by their willingness to roll back rights and protections to cling onto power and respectability in the eyes of their peers. Only total political power in the hands of the workers, defended by those same hands, can secure victories permanently. 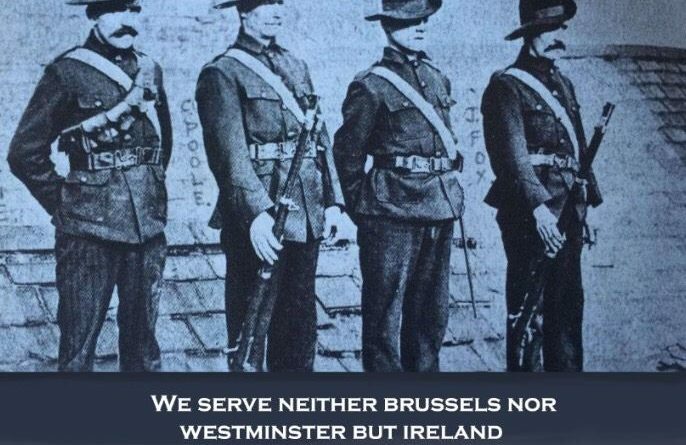 This is the fundamental lesson grasped by the Irish Citizen Army that still eludes many today. Connolly and subsequently the ICA saw the socio-economic inequalities as inextricably linked with the ability to democratically manage the economic functions of society, not with the colour of our flag. The ICA would advance that cause and as we see in their drilling, marching and preparations they intended to do so with or without the Nationalist/Republican forces and reformist voices too. The ICA represented at that moment in time a completely different direction for the workers of Ireland, one that distinguished and carefully identified economic inequality as an equally pressing issue to the national question and sought to conjoin the two and in doing so established the ICA as the model contemporary revolutionaries should be striving for. When we look at a political class that is preparing itself for the possibility of a united Ireland by drawing itself closer to both the United Kingdom and the European Union, we cannot forget that the aspirations of a nation do not end at the redrawing of borders on maps. Today, on the 23rd of November we remember and commemorate the ICA but we don’t simply draft this article for you to read and consider, we commemorate the ICA by aspiring to the vision it provided and the world Connolly died for. The Connolly Youth Movement seeks to encapsulates the works of Connolly and bring them forth to contemporary Ireland. We operate in a jurisdiction where 20% of the workforce is unionized and if you withdrew the mandatory unionized sectors such as teachers, health specialists and civil servants it would be half that. Most people in their early adult life don’t even know what a union is and for the most part, they don’t care. As far as we’re concerned we’re functioning in an environment where there may as well be no union movement and our strategy must focus on rapid, aggressive rejuvenation of the movement through recruitment and confrontation with the capitalist class. Yet our political work should not end there. We have seen how in other Western countries and in fact in Ireland successful community organizations take to the street and organize. In Oakton, California, the Black Panther Party created a network that was more impressive than every ‘left’ organization in the country and created radical programs to help their communities. In Ireland, we saw people who voted for establishment parties step out and block water meters and refuse the privatization of water. The Connolly Youth Movement firmly believes that the key to unlocking and unloading the revolutionary potential of the people of Ireland lies in the rejuvenation and regrowth of our fledgling union movement and the organization of communities. These two pillars will provide what once existed in the 1919 Revolution, what Connolly sought for the ICA to lead but did not see. It is worth observing the unique role that women had in the Irish Citizens Army because unlike other national movements which prohibited female membership, the Irish Citizens Army had female members and officers composed in its ranks. This was part of what Connolly envisaged for a new Ireland and significantly departed from the Catholic dominated mainstream republican movement. 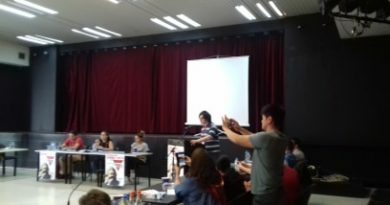 While today women comrades have come to the forefront of political struggles, they still remain under-represented in most political organizations as well as campaigns. The views of our organization differ little from the vision Connolly demanded of Ireland, that any successful revolution must truly incorporate the liberation of women and that any revolutionary movement must be held up, equally, if not more, by the women of Ireland. We believe, that the way to celebrate the Irish Citizens Army is to build the foundations for a new Irish Citizen Army, comprised of the most radical and class conscious trade union members and community activists who will stand proudly to defend and advance the intensifying struggle. Let us be clear, this will not occur overnight and we consider the regrowth of the union movement to be the foremost step. There will come a time once more though, when we strike for better pay and will need the ability to defend ourselves from the attack of the law and the private armies that the capitalist class will look to hire.